Back from blog vacation. Also actual vacation to see new grandson, Owen. Baby is beautiful. Lots of pictures on FB:) I miss him right now so I’m just going to move along and catch up on some other amazing things that have been happening, which I am calling “The Owen Effect” even though I can’t prove his being in the world is what is making my world change so much so fast so fabulous. First, yes, I still fit into my jeans! I did everything I said I would during vacation as far as eating and exercising goes. Even did I a little yoga. So much walking. Was great. But for me this food control is huge. On vacation. After donating all big jeans and buying smaller sizes. That’s when I usually go up, up, up. Not this time. Speaking of up, for some reason I just wanted to test out the Space Needle. I’ve been to Seattle before. I have family there. 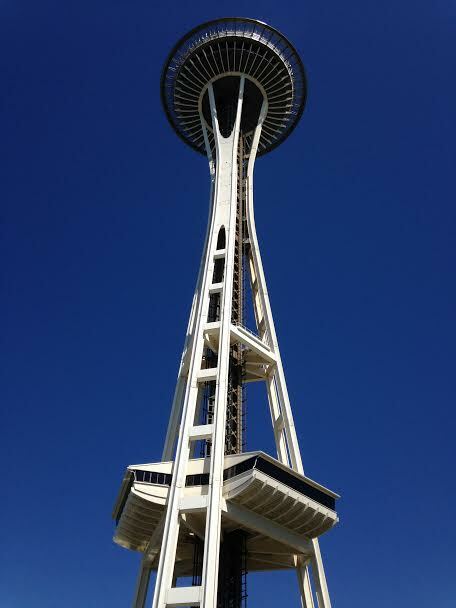 I have never wanted to even LOOK at the Space Needle, because I have a fear of heights. Panic attack level fear. So I just always say no to high places. Or take medication and sometimes emergency vodka. But the kids, they needed bonding time with baby, so I would see them every day for several hours but I also got in a few tourist type things. I have no idea how the Space Needle thing entered my anxious brain. And why I decided to try it without Xanax. Not even a half. No emergency vodka, no wine, no nothing. Just me and my ticket to terror. Funny, I didn’t feel terrified. I felt calm about it. A few months ago, I gave a speech, which before that day, public speaking always made me anxious. I did it when I had to, but I did not like it, and I turned down tons of opportunities to give talks. Then one day a friend asked, I couldn’t say no, so I did it. Fine. Fun, even. I figured my decades of teaching had cleared that fear. But testing the theory, I zoomed to the top of the Space Needle. And had not a moment’s fear. I know! What is happening to me? How am I becoming fearless when I am used to being more riddled with nerves than Woody Allen? It has to be Owen. No other explanation except maybe I want to not be afraid of stuff anymore. And use less medication. So, I decided to fly home without Xanax. Yeah, I worried a little about turbulence, but kind of shrugged it off. Even as I decided to do this, I was thinking ‘what is with you, girl?’ but I did it. And was fine. Not saying I’m cured of my multiple phobias. Driving over bridges and on mountains. (I can walk over bridges and on mountains, just not be in cars. Weird.) Helicopters. Yikes! Hot air balloons. Whoa. Being buried alive or, more likely, crammed into an overfull elevator. Those things still sorta make me shake inside. Still, I have had these fears for 30, 40, and 50 years. I remember the incidents that led to each fear, the repetition that led to anxiety and finally panic and a psychiatrist. Because I didn’t know what was wrong with me. I thought I was having some sort of breakdown or something. And, kind of, I was. Waking up at night terrified of suffocating? In a huge room in a king-sized bed? What is that about? I really didn’t do talk therapy with the psychiatrist. She gave me meds for one specific phobia (the driving, which let’s face it, agoraphobia would have been next had I not nipped that one). After a year or so she pronounced me “cured” and I was. Kind of. Except in certain high anxiety situations. Snow. Rain. The aforementioned mountains and bridges. Cognitive therapy is not a way to cure panic. The most popular form of cure is desensitization. You just every day do the thing you fear. While on medication. And then on less medication. Then less. Then none. That’s what I did. But really I can’t fly in an airplane every day or ride up to the top of the Eiffel Tower. (Was there. Could not do it.) I can’t cram myself into a coffin. So, when those things come up, it’s the meds. Except now, not so much. I have heard that phobias are inherited, like other genetic proclivities. I also heard they can come from an inner ear imbalance. Claustrophobia came first for me. Early, like 4 or 5. Then the driving thing, that was pure too many car accidents too close together. Heights, my mom trying to jump out of a gondola in Tennessee Hills in front of me. So she has it too and she’s not a Hines. Contagious? Kids don’t have it yet, let’s hope Owen escapes! You are amazing, Cynthia! Great job. Sounds like Owen had a huge effect on you. You are a walking example of how to live fully and embrace life. Yay you for facing these things! Okay, so just looked up that bit in the book by Dr. Sharon Heller that I mentioned (Too Loud, Too Bright, Too Fast, Too Tight). Basically, what it says is that research done by Dr. Harold Levinson revealed that phobias are often (in 90% of his research cases) linked to faulty inner ear (vestibular) processing, which makes them physical, not psychological. He treated patients with anti-motion sickness drugs, antihistamines and other medications used for inner ear problems, and gave some of his patients exercises for vertigo, and had amazing results. Interestingly, he did the same thing with dyslexia cases, and achieved equally awesome results. So, there’s something for you to explore perhaps for some of those more pesky, challenging phobias, like driving across bridges. I so enjoyed seeing you in Seattle. I hope you come back next year!! Thank you Laura for the info (writing it down now) which I will take to my doc! What a relief that would be to have these things be physical and treatable. I do have problems with my ears, too, so it makes sense. I loved our time together! Will be back, I hope for the writer’s conference!